The latest and most up to date Vizzed news. The virus has spread. The emergency relief team working to contain the Davideo7 virus has become infected, and now the symptoms of this virus have become apparent in each of them. They are now each masquerading as Davideo7... If you see a Davideo7 during your venture across Vizzed Board, be sure to be extra careful and examine him carefully. It might not be the one you think it is. For more information... you're on your own. Good luck out there. 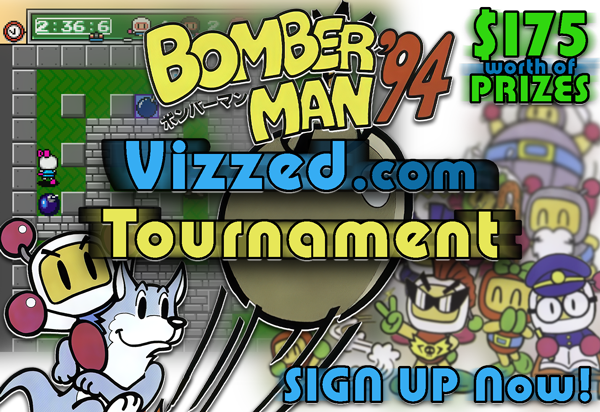 I've extended the signup deadline by a week for the annual Bomberman '94 tournament. I was hoping to get more users signed up for this tournament. We have a good amount at 16 right now but was really hoping to get at least 20 users. So if anyone is interested in trying for any of the cash prizes (us $175 worth) or if anyone is interested in hanging out with fellow Vizzed users, there's nothing to lose with signing up. The tournament is mostly casual for the most part, it doesn't get very competitive until the final weeks of the tournament. Spring 2019 Netplay Tournament: Bomberman '94 = US $175 / 750K+ Viz Worth of Prizes = Signup Now! For the first time in years, I'm offering out cash prizes to the top 3 winners of the annual Bomberman '94 Tournament! I'm planning on making this as much of a community event as possible. I'm trying to get as many users involved and also want to get as many of the matchups live streamed as possible so that we can also get a lot of users involved with spectating the season long event. This tournament is incredibly flexible to everyone's schedule. Each week you can choose between the selectable times and days that you're available to play. As long as you're available 2 nights a week between 7 PM - 9 PM central time Wednesday-Saturday nights then you'll be able to participate. You can even miss a few matchups and still have a shot at making it to the final matchup (but just don't miss too many otherwise you'll be added to the netplay ban list). Earn up to 100K Viz in the above competition! For more information, refer to the previous announcement. On Wednesday, 2/27/2018, from 4-7 PM (central time zone) we'll all be listening to and rating the songs from the PlayStation Vita Music Competition. Shortly before each song finishes, I'll give users a link to where they can rate each song and the song submitters get points for any rating above a 3 (out of 5). I will be hosting this event on my Twitch channel and I'll be giving away a total of $250 worth of Steam Games in the form of Vizzed Raffle Tickets which can be used to redeem Steam games and other digital games including eShop, Uplay and more. The Raffle Tickets can also be traded into the Vizzed Market for 10,000 Viz each. On Wednesday, 1/30/2018, from 4-8 PM (central time zone) we'll all be listening to and rating the songs from the Nintendo Wii-U Music Competition. Shortly before each song finishes, I'll give users a link to where they can rate each song and the song submitters get points for any rating above a 3 (out of 5).